“The Big Print” is comprised of art from 1180 kids and adults and an overall design inspired by historic Norwegian knitting patterns. 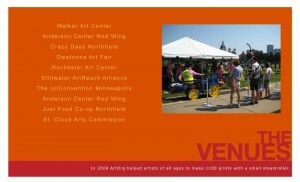 The Big Print is a collaborative public art piece from the nonprofit art group called ArtOrg. 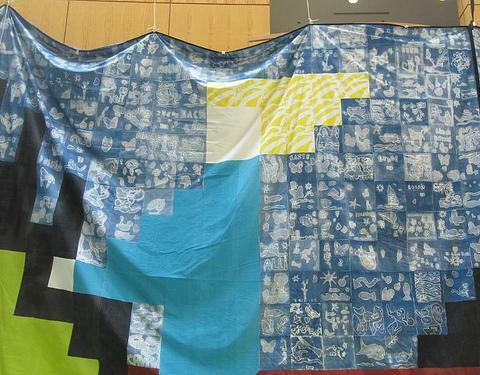 The Big Print was installed on Saturday, October 16, 2010, at Buntrock Commons at St. Olaf College in Northfield, Minnesota. 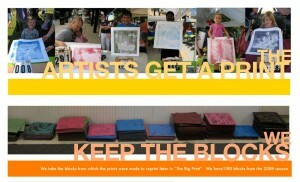 We invited all people who made a print to celebrate with us from 2 to 4 pm Sunday, November 21, 2010 for the event we called the “Big Print Block Party”. 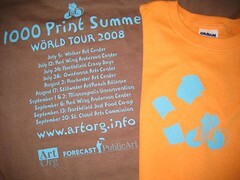 ArtOrg started printing for kids and adults with steamrollers in the fall of 2006. The first small steamroller event for kids was at the Minneapolis Institute of Arts that September, and that was followed by a large steamroller printing event in October for a Day of the Dead celebration in Northfield. 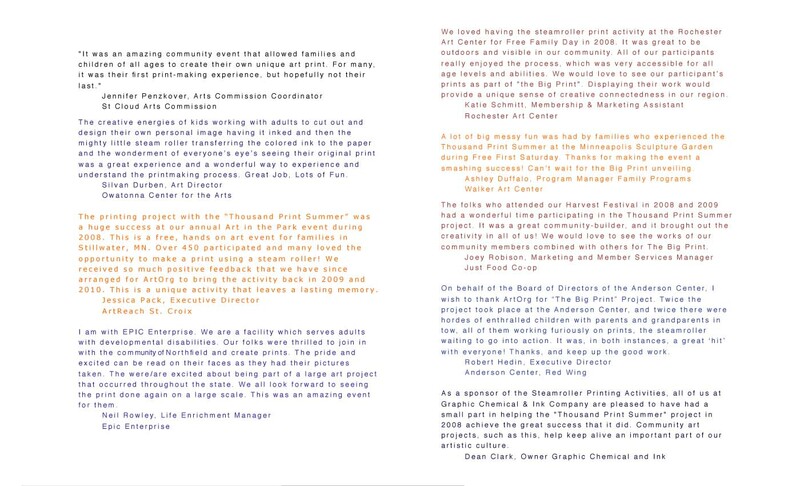 Dave from ArtOrg then successfully applied for an artist grant from Forecast Public Art to build an ongoing public art event around steamroller printing which we call the “Thousand Print Summer”. The Big Print is comprised of 1180 works of art from the 2008 Thousand Print Summer. The art was created at during ten different events: Walker Art Center, Anderson Center in Red Wing (twice), Owatonna, Stillwater, St. Cloud, Rochester, Northfield Crazy Days, Northfield Just Food Co-op, and “The Unconvention” on Nicollet Mall in Minneapolis. All Thousand Print Summer events have been, and likely always will be, free and open to the public. 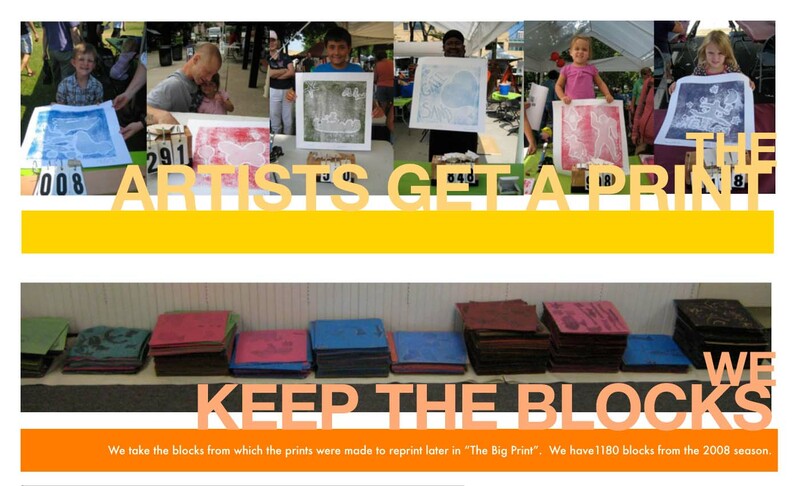 During those Thousand Print Summer events in 2008, each participant created a printing block, inked it up, placed a piece of paper over the block, and it was run over by the small steamroller. A wonderful paper print was produced, the print was signed and stamped, and taken home. ArtOrg kept all of the printing blocks, however, to use them eventually in a large collaborative work, which turned out to be The Big Print. The Big Print is very large and the wall in Buntrock Commons at St. Olaf College is 82 feet wide by 36 feet high, and the wall is completed covered on both sides. 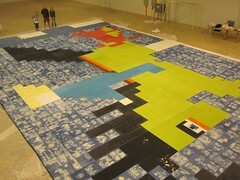 This brings the total area of the piece to about 5000 square feet. 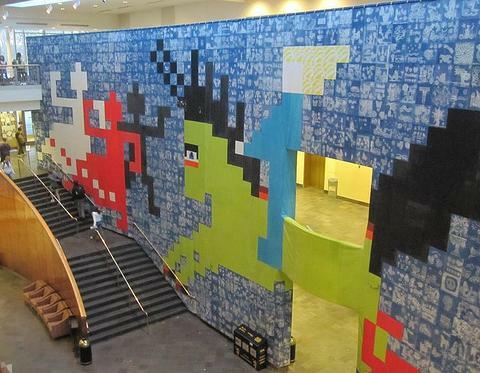 A goal of the piece was to completely cover every square inch of wall. 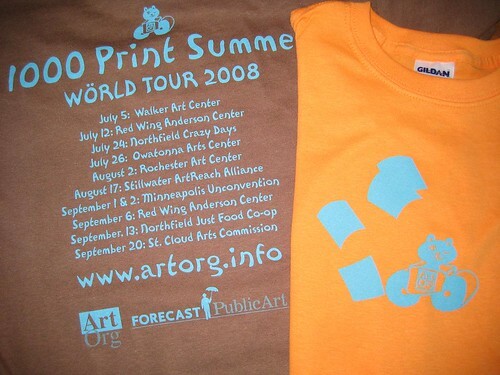 The specifics of the so-called opening event, which we are called the “Big Print Block Party”, was planned with help from participating venues from 2008. When kids checked in, we numbered the blocks and took down their own or parent’s emails so they could be contacted when we reprinted their blocks. If half of the kids showed up with one parent, the opening event could have attracted a thousand people. Alas, we had very poor weather–an ice storm that paralyzed the whole area. Thanks to those locals who braved the weather and attended the event! 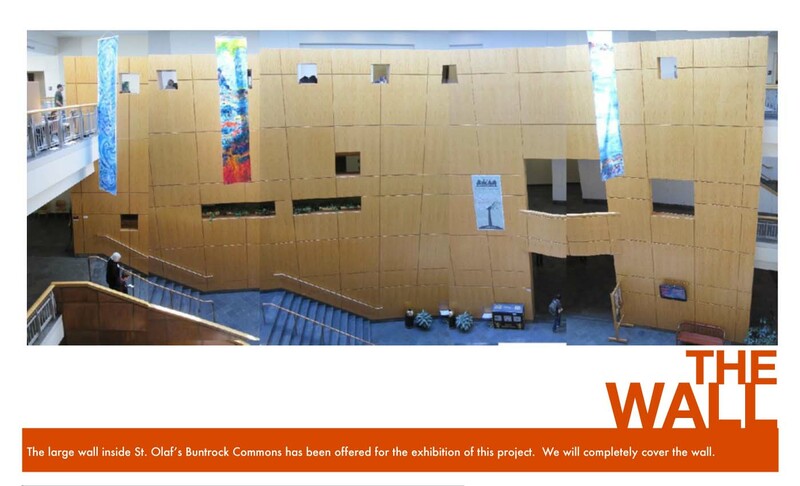 ArtOrg has so far funded the costs of this project ourselves, because we believed in the project and could not turn down the opportunity and challenge provided by the director of Buntrock Commons, Tim Schroer. The siren’s song of the wall proved too sweet to ignore. We wish to thank St. Olaf College for the in-kind donation of the wall itself. We, writing as ArtOrg staff, also wish to thank our board of directors for the support to go forward with the project, knowing the funding was not yet in line to fully support the project. Please contact us if you would like to learn more about sponsoring of this project. 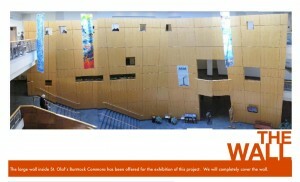 We are also looking for additional venues to exhibit the work. 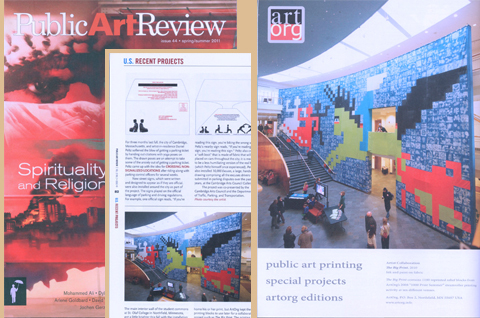 Also, we have learned that The Big Print will be featured in the “Recent Projects” section in the next issue of the Public Art Review, an international publication devoted to public art. 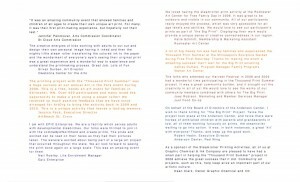 ArtOrg has also taken out an advertisement in this issue to showcase the work.